The nature at its best at Candolim beach white sand and dunes with all its beauty and calm and quiet surroundings. 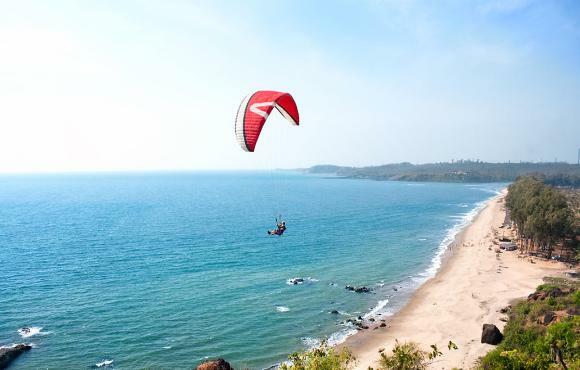 Candolim beach is the place of different water adventure sports, amusements fun and beach activities like parasailing, water skiing, wind surfing, fishing and many more are the attraction for tourists and visitors. Yoga and meditation has also becoming popular at lovely Goa beaches for the ideal environment. Unique beach excursions are organized in Candolim beach in which tourists are taken into the middle of the sea to enjoy sightseeing and sunset views. Nightlife of Candolim is extremely calm compared to hustle and bustle of other beaches of India. There are many bars and restaurants decorated with wood and palm leaves along the beach. Tourists can enjoy the famous food items of Goa and taste of feni, a locally brewed drink prepared from cashew or coconut.